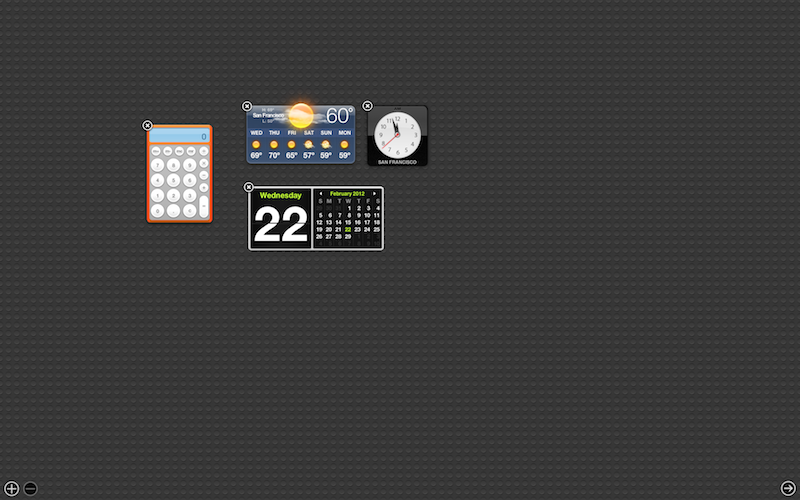 Dashboard gets a Launchpad-style widget organization feature in this summer's release of OS X Mountain Lion, offering a standardized user interface that will be more familiar to iOS users. 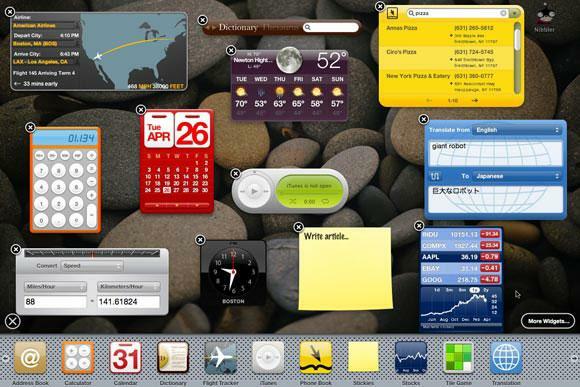 Dashboard, first introduced in OS X 10.4 Tiger, originally presented widgets in a drop down layer that appeared to float above the desktop. Additional widgets could be selected from a Dock-like perforated steel plate interface that appeared from the bottom of the screen. In OS X 10.5 Leopard, Apple introduced Spaces, a virtual desktop feature for managing multiple screens each containing its own environment of active apps and their windows. 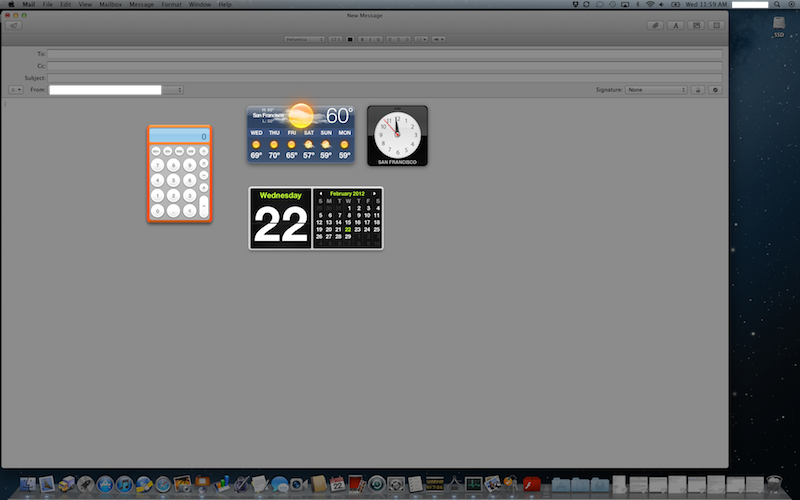 In last year's OS X 10.7 Lion, Apple made Dashboard into a Space by default. Instead of depicting Dashboard as a special mode that whisks in above the desktop as a visual overlay, the widget layer is simply a panel that slides in from the left (evoking the left-most strip of audio playback and screen orientation lock controls accessible from the iOS multitasking bar). Combined with Mission Control and Full Screen Apps, this intended to make Dashboard easier to conceptually work with, and easy to invoke with a four fingered swipe to the right. However, Dashboard retained its oddball widget picker, something that initially seemed to be visually related to the iOS Home page and Mac Dock, but which behaved unlike either. In OS X 10.8 Mountain Lion, Dashboard get iOS-like widget management parallel to OS X 10.7 Lion's Launchpad manager for Mac apps. Rather than a single "plus" icon for bringing up a widget picker strip, Mountain Lion presents the Dashboard Space with a plus and minus icon. Clicking on the Plus icon brings up the Launchpad-like Dashboard widget screen. 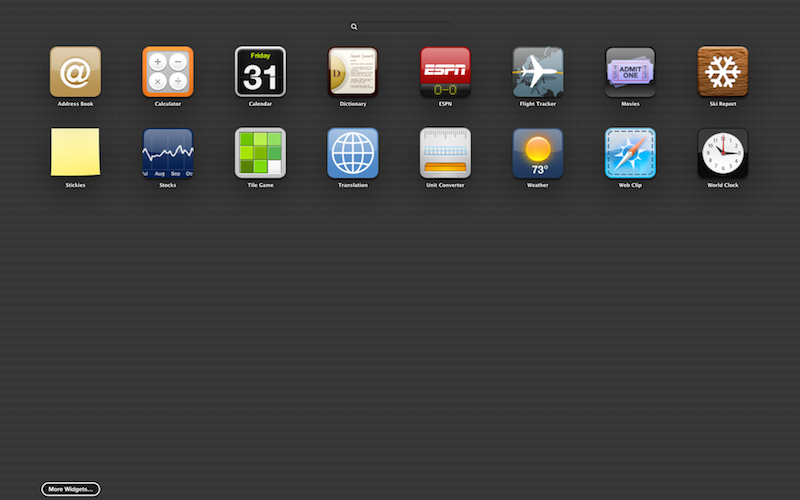 Just like Launchpad (or the iOS Home screen), you can now drag icons on top of each other to create organizing Folders. Rather than dealing with a "widget manager," you can directly search for widgets from a field at the top of the widget page. Dragging World Clock onto the Calendar icon automatically creates a "Productivity" Folder, which works and looks just like Launchpad and iOS. 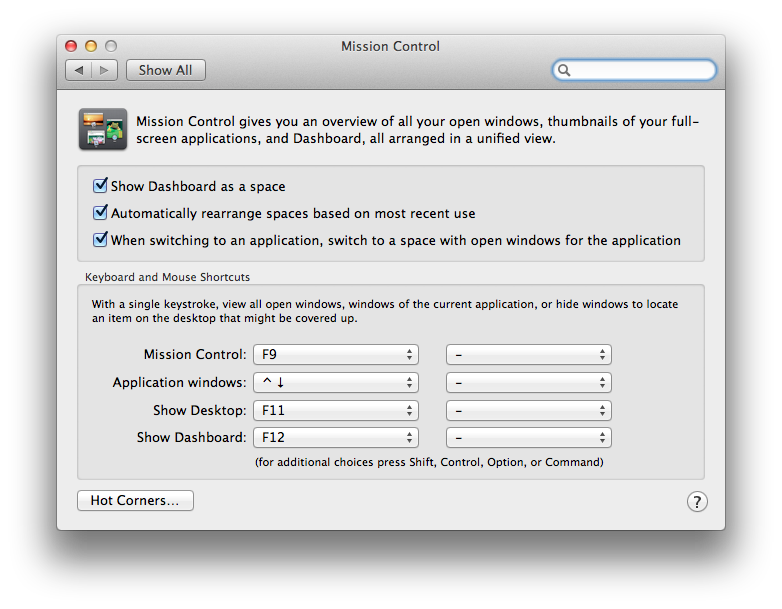 There's still the option, in the Mission Control panel of System Preferences, to not "show Dashboard as a space." When you select this option, Dashboard appears as a translucent overlay as it did in Tiger. 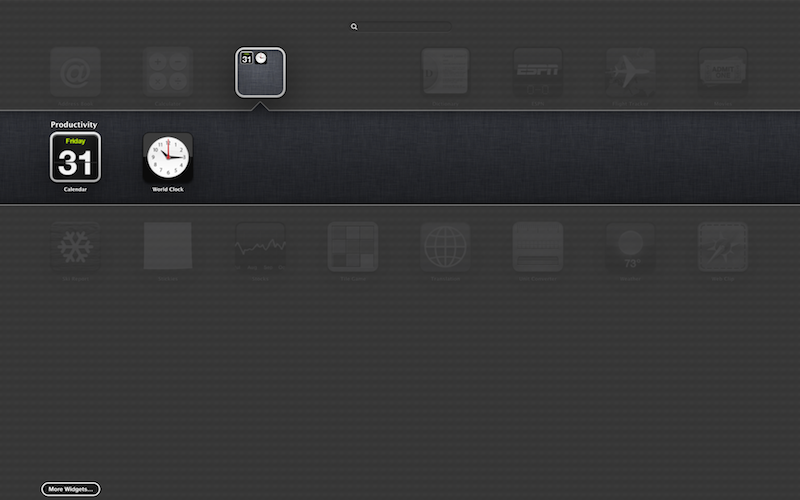 Dashboard can be invoked by a keyboard shortcut or by launching it from its Dock icon or via Spotlight. The only thing really missing from Dashboard is a featured connection to the App Store; to get more widgets, Apple simply links to its Dashboard website. It wouldn't be a stretch to see Apple add Dashboard widgets support to a coming version of iOS, adding both a store to sell widgets to both iOS and Mac users and iCloud support to sync your widgets installations between all your devices. China Telecom expected to sell 3-5 million iPhones, Mountain Lion to reinforce iPhone "halo"